Are you ready for Tuesday, February 25 to just get here already? We completely understand! Even though the wait really hasn’t been that long between the last “Ink Master” and this one, it’s easy to get caught up in the greatness that is Spike’s tattoo competition. It’s darker and grittier than some of the other competitions out there, and feels much more in-sync for the real tattoo fanatics. The video below is basically a little window into the soul of the tattoo artist, at least when it comes to their answers to a very important question: What’s the best way to behave in a tattoo shop? We’re not necessarily saying that the average parlor out there expects you to behave like you are attending a dinner at Buckingham Palace, but there are some simple rules to follow in order to ensure that you actually get a good tattoo. For example, if you really want to get something that looks good on your skin forever, is it really that good of an idea to bring all your buddies into the shop to turn things into a party? The cast for “Ink Master” this time around is a large one, with there being seventeen different contestants all facing off in order to win the title. You also have Kyle Dunbar returning from last season (Yay! ), as he was voted by the fans as the most deserving to get another shot at the title. Let’s hope that time the show (and judges) have a different trajectory / edit than they did with Tatu Baby. We don’t want a repeat of the judges giving special favor because Kyle was America’s favorite. What do you want to see on this upcoming season the most? Share some of your thoughts below, and head over to the link here if you want to get some more news related to the show. You can also sign up now to get some more scoop on everything we cover emailed straight to you. 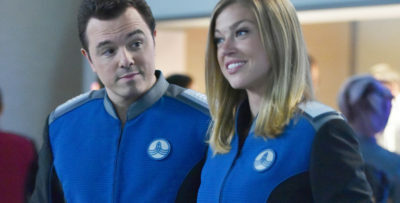 The Orville season 2 finale theory: Could the villain actually be … Kelly?